San Francisco was treated to a very rare sight of brightly colored tops, skirts and trousers sauntering downhill along Sutter Street toward Montgomery. Passers-by were curious. Who are they? What’s going on? Their quizzical looks darted from the colorfully beaded combs down to the leather-clad feet of these mysterious visitors. “They’re indigenous people from the Philippines here to celebrate the opening of the textile art exhibit at the Mills Building on 220 Montgomery," someone finally provided the answer to the unasked question. 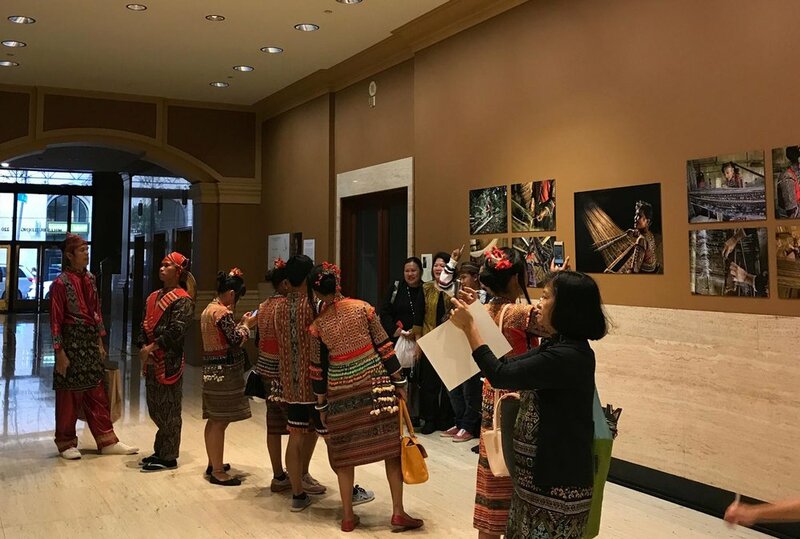 Earlier at the Philippine Consulate on Sutter Street, T’boli, Mandàya and Maguindanao performers treated a crowd of San Franciscans to an array of traditional music and dance from the hinterlands of Southern Philippines. The T’boli inhabit the area around Lake Sebu, South Cotabato. This lakeside community is known for its exquisite, dream-inspired weaving using the abaca plant (musa texitilis, a banana plant variety) and known to many as tinalak. The Mandaya are from Davao Oriental. A third IP group, the Maranao, did not perform at this time, except by Sata from Maguindanao. They all traveled the eight thousand miles across the Pacific, landing in San Francisco only two days earlier. The event opened with a Sata, a cultural master, played the horizontal gongs called kulintang. The T’boli followed with a greeting song performed on a bamboo flute. Edgar also displayed his skills at the jew’s harp, drum and hegelung (2-string boat lute). Rosie, the group’s leader, broke out in a rhythmic, full-throated chant welcoming solidarity to a mesmerized audience. Their dances evoked birds in their fearless flight and the sweetness of courtship that mimic the life of a mythical princess. Rosie, a T’boli cultural master, danced in circles to the rhythmic beat of the hegelung, its twanging drone enthralling the audience. A panel of discussants of Bay Area- and visiting experts explored the challenges of promoting indigenous weaving and cultural arts in a region that has not seen real peace since the ’60s. The National Commission for Culture and Arts (NCCA) Director Marichu Tallano, explained the mandate of the NCCA to promote traditional arts and crafts of Philippine indigenous communities which comprise 18 per cent of the total population, speak over a hundred languages and inhabit highland and coastal regions across the length of the Philippine archipelago. It is a daunting challenge. NCCA provides research support and manages a school of living traditions. It makes certain that these cultural communities remain at the forefront of national cultural events. Beng Camba, Enterprise Coordinator of the non-governmental organization (NGO) Non-Timber Forest Products-Exchange Program, described how they promote forest stewardship and livelihood creation using natural forest products - food, textiles and basketry along sustainable and ecological practices. Kitty Caragay, assistant professor of Clothing Technology at the College of Home Economics, University of the Philippines, described aspects of her NCCA-funded grant on women weavers, highlighting the need for regional peace and conditions that allow focus akin to meditation in order to weave. 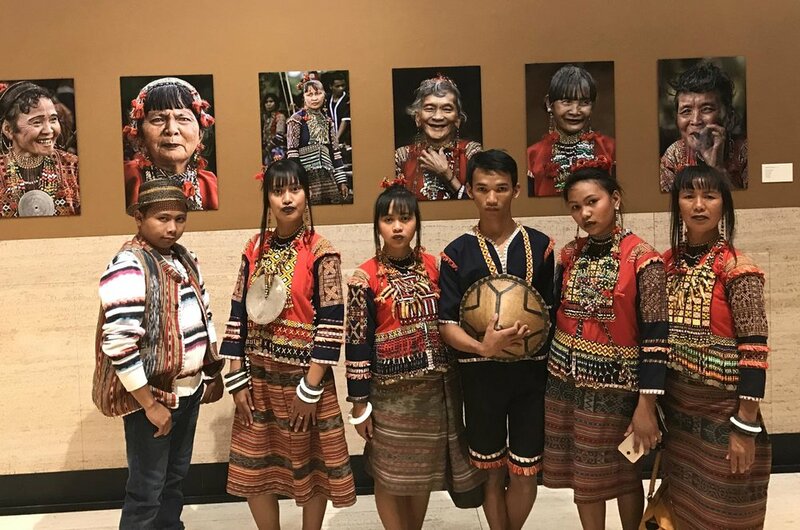 Together with Kitty Caragay, panelist Anthony Cruz Legarda, artistic director of The Hinabi Project, traveled around Mindanao searching for master weavers to commission works for the ongoing exhibit in San Francisco. Despite the difficulty in reaching the weaving communities and, at one point, the possibility of losing a weaver’s work due to military crisis, their patience prevailed. The weaver persevered and completed the project albeit in an evacuation camp away from the troubled city of Marawi. Joyce Caragay, professor of social work at the University of the Philippines, listed the necessary conditions in which social programs initiated by the national government can directly contribute to the weavers’ well-being, a segment of the population that does not show up in national statistics. Moderator, Dr. Michael Gonzalez, The Hinabi Project research director, concluded the discussion with a challenge to institutions and government to develop structures that not only promote indigenous culture and arts, but to formulate an integrated solution that secures their uniqueness, their diversity of indigenous cultural identities and inclusion in national socio-economic culture. The goal of The Hinabi Project is not merely to showcase Mindanaon textile artistry, but to highlight for the public the difficult conditions of work that must be addressed by those who care about their culture. The day concluded as it began - in celebration. The Mandaya were led by Christine Banugan, perhaps one of the few female chieftains in the indigenous world of the Philippines. Young, articulate and compelling, she narrated the origin of Dagmay, the craft of Mandàya weaving. Drawn from folklore, the Dagmay weave is said to be a vision and a gift from the spirit goddess Tagamaling. She then invited the audience that included Consul General Bensurto to join them in a community dance. The crowd then dispersed and the dancers made their way to the Mills Gallery on Montgomery where their arts and culture hung in celebration along the walls of a venerable building. Indeed, much of indigenous weaving are circumscribed by rite de passage. Weaving was and still is an extension of family and community connections, and peace, stated repeatedly, is an elusive goal. It is this very concept that imbues The Hinabi Project, Weaving Peace and Dreams: Mindanao Textile Arts exhibit at the historic Mills Building. The project brings together one of the most comprehensive Philippine textile exhibits in San Francisco. Over fifty objects are on display from September 18 through November 28. On view are vintage textile pieces from different cultural communities, including a few rarely seen items by both Muslim and non-Muslim weavers. Also included are several panels designed along more contemporary lines by Anthony Legarda Cruz that were commissioned to master weavers. ArtSource, the Mills Building arts management group, generously provided the exhibit space and installation. It was a fortuitous partnership. The Hinabi Project had been searching for an alternative venue after Asian Arts Museum shifted its renovation schedule. The structure of the Mills Gallery which allow pedestrians passage from Montgomery St to Bush St, actually made the realization of the exhibit ideal. One could start at either end of the passage way. From the Bush St, the visitor first encounters silk and cotton textiles and artifacts from the Muslim weaving tradition; on the Montgomery side, textiles are made of abaca from non-Muslim groups, the Mandaya and the Tiboli among others. At the center of the gallery hang The Hinabi Project’s commissioned works which borrow from both these traditions. These commissioned pieces attempt to integrate motifs common to both weaving communities like fern, mountain, tree or frog shapes but at the same time respecting the customary designs unique to each cultural group’s identity. Intrinsic to this work is the aspiration for peaceful existence. While historically warrior communities, IPs are aware of the necessity for peace and harmony. It is symbolic that weaving is done by women who know in their hearts that the future of their children is predicated on peace, even as they rely on their dreams to design their weaves. It was a pleasure to observe the T’boli, Mandaya, and Maguindanao gather at their respective displays to marvel at the articles that conveyed their aesthetic and cultural heritage. For some, it was an experience of rediscovery and for others, utter revelation. Long gone designs and motifs came to life again on the walls before them. Names of weavers who have passed from this world were uttered in passing. Stunning portraits of weavers, shot by a local photographer with a natural ethnographic eye, Eden Jhan Licayan line the walls of the Montgomery side. His magnificent work renders a reality to a vibrant culture and people. The Mandaya thrilled to see their elders in full-size portraits, lost no time in taking selfies beside those portraits. A similar array of portraits from the Tausug sultanate line the Bush St. side. Salika, the Maguindanao weaver said quietly as she moved along the gallery, “I’m so overwhelmed and very proud!” The Hinabi Project’s Textile Arts of Mindanao has done its dayaw, cultural mindfulness at its best. Weaving Peace and Dreams: Mindanao Textile Arts. The Mills Building 220 Montgomery Street, San Francisco. Exhibits runs from September 18 to November 28, 2017. Michael Gonzalez, faculty at City College of San Francisco Philippine Studies Department has recently returned from a Fulbright research to investigate the socioeconomic conditions of weavers in the Philippines.